My New Guinea Impatiens are wilting and dying. Is this normal ? Be sure any container has adequate drainage holes; these plants are susceptible to root rot. Temperatures: New Guinea Impatiens do not like cold at all. These plants are extremely sensitive to improper watering. 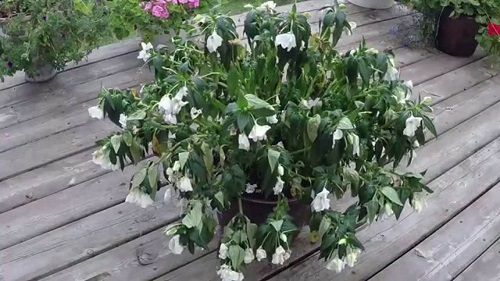 They wilt quickly but usually revive if watered soon after wilting. Light: Although they are touted as light-tolerant, and they are compared to traditional impatiens (I. walleriana), they are not sun lovers. Most do best with morning and afternoon shade and an eastern exposure, or four to six hours of sunlight. In hot weather, they may need additional protection from the sun. Too much sun will result in smaller and fewer blooms and leaf damage. Full sun often kills the plants. Soil: They need moist but well-drained soil. Be sure any container has adequate drainage holes; these plants are susceptible to root rot. Temperatures: New Guinea impatiens do not like cold. Nighttime temperatures below 45 degrees are damaging, sometime fatal. Ideal temperatures are 70-80 degrees in the daytime and 55-65 degrees at night. Water: Some claim that overhead watering is problematic and recommend that they be watered from below, but I did not locate any scientific data to back this up. These plants are extremely sensitive to improper watering. They wilt quickly but usually revive if watered soon after wilting. Fertilize: New Guinea impatiens will benefit from an application of slow-release fertilizer when planted or a light feeding every two weeks with a balanced water soluble fertilizer. Problems: As mentioned above, these plants are very susceptible to root rots (pythium, phytophthora) and stem rot (rhizoctonia). They get impatiens necrotic spot virus and tomato spotted wilt; both cause black spots and lesions on the stem as well as stunted or distorted leaves and total plant collapse.